Come join the recreational Lakefront Leagues at North Coast Harbor, hosted by the City of Cleveland and Downtown Cleveland Alliance. The Lakefront Leagues are 8 week sessions of your choice of Kickball, Sand Volleyball or Bocce Ball, and are in their 4th season of activation. All league games will take place on Wednesday Evenings, starting at 6:15 – 6:30pm, throughout the summer. Each season will be capped off with a Playoff Social, a players only party to take place at the end of each regular season! Below are the specific season dates for each sport! Below is more information about league formats & registration! Kickball will be hosted at Voinovich Park & Great Lake Science Center! *Game times set when schedule is released prior to season start. Sand Volleyball will be hosted at the ODNR Sand Courts on E. 9th Street pier. Bocce Ball will be hosted at Voinovich Park. Kickball will be hosted at Voinovich Park. Cost of league administration, & venue covered by the City of Cleveland. *Registration Fees cover six (6) players. Additional players must purchase an “Extra Roster Spot” to receive team t-shirt & admission to the Playoff Social. Registration fee covers Team Shirts & admission to the Playoff Social. Each player will be invited to attend the Lakefront Playoff Social, on June 26 (Season 1) and September 11 (Season 2). Players attending the Social must be 21 years of age. ID’s will be checked at the door. All players must have provided wrist band to enter the 2nd floor of Nuevo Cleveland. Top 3 teams receive Lakefront League plaques with team photo. Meter parking on E9th Street and Erieside are free after 6PM. Parking on the E9th Pier is monitored 24/7, parkers pay by hour with credit card or exact cash. Can I bring alcohol to Voinovich Park and/or North Coast Harbor sand courts? No- the park is City property and open container is prohibited. However, Nuevo Cleveland gives our players an extended “Happy Hour” menu until 8PM on League nights- visit the registration tent to receive a voucher. 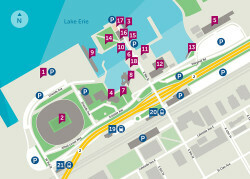 The Rock Hall also hosts “Summer in the City” concert nights with beer garden and a food truck on their plaza- if the team is looking for a hang out spot pre or post game. Can I still have sub players if I only paid for the minimum team (8 kickball & 6 volleyball & 4 bocce)? The fee covers our finals party, which is food and drinks for players. The additional player fee is for those players attending the finals party outside of the minimum team. You may have sub players throughout the season without extra cost, however, only the number of players you paid for will be allowed entry into the players party on finals night (volleyball and bocce) and semi-finals (kickball). Reminder all players attending the party must be 21+ and show valid ID for entry into the party.